4/393 Conlog VW Audi Alarm Battery (4-393, 4/SR48). Type: Silver Oxide. Voltage: 6.2V. Diameter: 7.9 mm. Height: 21.6 mm. Price: £10.00 each. £9.00 each if you buy two or more. P&P included. Also known as: 4x393, 4/393, 4/393, 4/SR48, AP021 WBCH, GPCA24, GP4/393, CA24, GP-CA24, Conlog Alarm, VW Alarm, Audi Alarm, Volkswagen Logic Alarm. 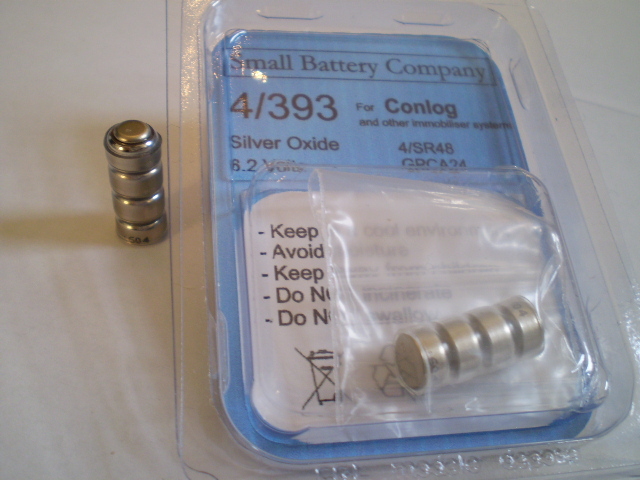 This 4/393 an unusual and increasingly hard to find silver oxide battery. The 4/393 silver-oxide battery is commonly used in remote alarm controls for VW and Audi alarm systems. The 4/393 is particularly widely used in later Volkswagen Logic immobilisers known as "Logic", "Conlog" or "Conlogic". These immobilisers were widely fitted to Audi, VW and Land Rover vehicles. When fitted to Land Rover vehicles it carries the Landrover partnumber STC8916. The 4/393 can sometimes be sourced from Volkswagen and Audi dealers but they have been known to charge over £20 each for them. Earlier versions of the Volswagen Logic Immobiliser use the 5/392 silver oxide battery. The 4/393 batteries have a shelf life of 5 + years, so why not buy two or more. Take advantage of our reduced price and make sure you are not left without a working keyfob remote next time your battery runs out.